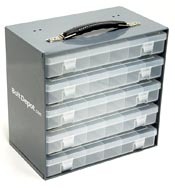 Perfect for organizing collections of small fasteners or parts. 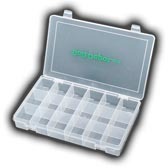 These boxes are made of clear high strength oil resistant polypropylene. 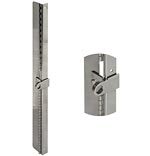 Heavy duty hinges and two snap latches secure closure, preventing parts from moving between compartments. The matching 5 box slide rack is stackable and has an easy carry handle for taking your complete collection with you. 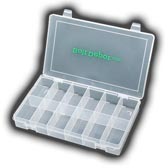 Overall box dimensions are 11(w) x 6-3/4(d) x 1-3/4(h).